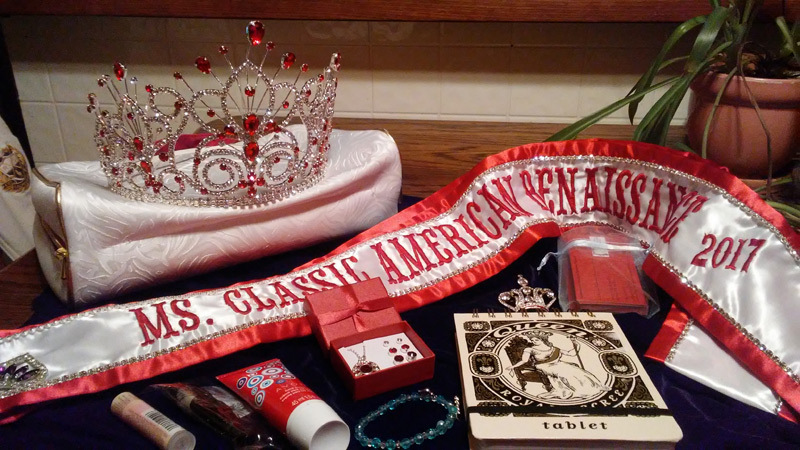 Ms Classic American Renaissance 2017: Competing in Pageants when you are OVER 40--- A Great Place to Blossom! Competing in Pageants when you are OVER 40--- A Great Place to Blossom! A Great Place to Blossom! My first experience with pageants was in Wyoming. I was selected as “Mrs. Cheyenne America” and this was the beginning of my personal quest for the crown… In my opinion, the pageant was lots of fun and I had performed my best as I had no idea what I was doing, I simply wanted to be able to raise more money for my charities and this was an awesome avenue to accomplish that goal. After the pageant one of my competitors mentioned to me that I was “too old to be there and they were not sure why I had bothered showing up”. I knew why I was there. I had successfully raised money for a local animal shelter using my title and decided this was the way I wanted to help my charities. What in the world does age have to do with that? In the last 10 years, I have competed in a lot of different systems. I have met some of the most intelligent, charitable and successful career oriented women in the country. The over 40 pageant woman in the 21st century is not what she used to be. Today, she owns her business or is at the top of management and works as a spokeswoman or chairperson for some of the finest charities in the country. Many of these women even have their own non profit organizations. These beautiful and intelligent women are in politics, entertainment, business, legal, military, medical… and most are at the top of their field. Participating in pageants after age 40 has greatly helped my business life. I decided if I was going to do this, I was going to give it my best. I looked for pageant coaching online and found many great free resources as well as things I could order. I watched videos of previous pageants, listened to workshops about how to speak better, learned how to ace the pageant interview, developed better stage presence, did lots of interview skills work, …and much more! Adding these tools made my business presentations better and helped me to communicate to my clients and potential clients in a more effective manner. This of course produced more sales and more happy clients. In my charity world, I am now able to use the skills I learn from competing in pageants on a larger scale to make me a better and more effective volunteer. I found skills that I never knew I had and starting doing things I had never tried with a new enthusiasm. All of the time I am discovering things about myself that I never knew and I am finally becoming the woman I have always wanted to be. Competing in the Ms Civic” division I learned how to scrapbook an entire year of charity events! Now I want to scrapbook every year and it is an amazing tool to show potential donors. Being a national beauty queen (and even as a state queen) I find that I am able to get through doors and get to decision makers much faster than before. It is much easier to solicit donations and get support for events with my crown. So get out there and WIN your title ladies! It will bring out talents and skills you never knew you had! So true! I grew as a person and use many of the skills I picked up competing!